Saffron Tree, a blog/website dedicated to children's and YA books, based in India and the United States, reviewed my book Eight Treasures of the Dragon recently. The reviewer, Sathish Ramakrishnan, and his two young sons actually seemed to enjoy the book! All, except for the one story from Malaysia, entitled the Dragon of Tasik Chini. I can't say I blame Sathish as I wasn't all that keen on the story either. Unfortunately, even after going through several old books and an extensive Internet search I could only uncover that one dragon story. Fortunately, Sathish seemed really taken by the story from India, Prince Mombathi (The Candlewax Prince), even more so because it was completely new to him. The story is based on The Wax Prince, by Shovona Devi from her book The Orient Pearls: Indian Folklore (1915). The fact that she was Rabindranath Tagore's niece added to the allure. I also did a Q&A for Saffron Tree, where Sathish posed this all important Question: Are Nagas in fact Dragons? The truth is, I asked myself the same question while researching the book and I'm quite sure they are... nagas are the precursors of the dragons. Dragonlore is prevalent all over East Asia - China, Japan and Korea; but in South Asia and Southeast Asia, it is the naga which takes the place of the dragon. In any case, how many countries can boast of a real lake associated with an authentic dragon (or naga) legend? The story of Naga Sri Gumum, for that is the name of the dragon, has been told in oral folklore for centuries in the Lake Chini area. The lake is the second largest freshwater lake in Malaysia; the largest being Lake Bera. In fact, Chini is actually made up of 12 interlinked lakes and may also be connected to Bera through a subterranean waterway (the last info is based on folklore). 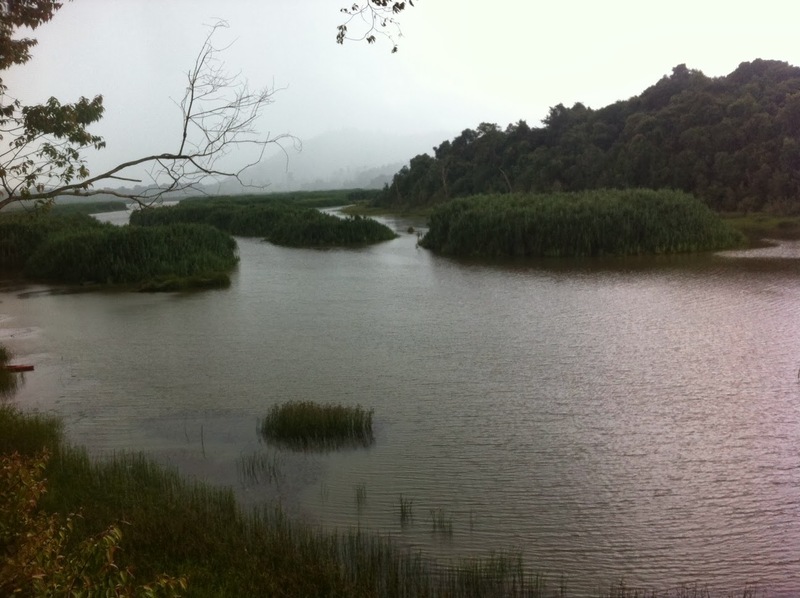 The size of the lake depends on the season; during the monsoon rains from October to January, the water of the lake rises and the 12 lakes may turn into a single body of water. Lake Chini is also a UNESCO Biosphere reserve with 100 species of fish and 200 species of birds and is a bird-watchers paradise. If you are interested, there are plenty of cheap but comfortable home-stay accommodations and small chalets around the lake. 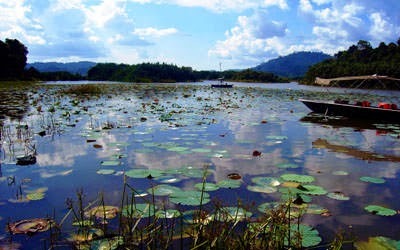 Certain parts of the lake are covered with lotus plant. But more important is the folklore associated with the lake - there is supposed to be an ancient Khmer city or more likely a citadel at the bottom of the lake. In fact, it has been suggested that the city dates back to the 5th Century and was intentionally flooded to keep it from enemy hands. Fascinating of course, except that the Khmer Empire (9th Century - 14th Century) did not yet exist in the 5th Century, what existed then was the kingdom of Chenla. If there is a Khmer citadel under Chini, perhaps it originated from the 11th Century. It was during this time that Harshavarman III is said to have abandoned Angkor to take refuge in the south when the throne of Angkor was usurped by the conqueror, Jayavarman VI. Harshvarman's followers and successors continued a long struggle against Jayavarman VI and may have sought refuge in the Lake Chini region. June to September every year. Or it could have happened in 1400 AD when the Thais sacked Angkor, twice, effectively causing the demise of the Khmer Empire. It's quite possible that when Angkor was attacked, a group of people may have sought refuge in a safe haven such as Lake Chini, which may have reminded them of Tonle Sap, albeit on a much smaller scale. Why does such a legend persist? 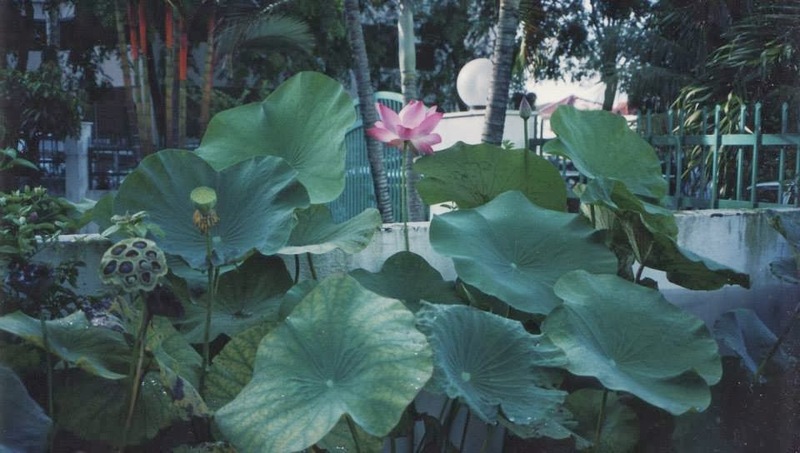 There are some clues - for one thing the profusion of sacred lotus, Nelumbo nucifera, growing on the lake. This is a plant not normally found growing in the wild in Malaysia. 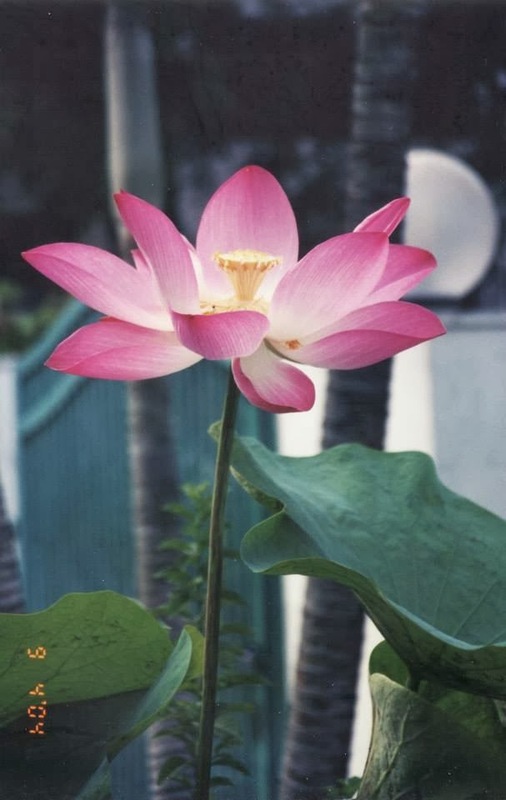 Some scientists have speculated that the lotus seeds were brought by Hindu priests (if it happened in the 11th Century) or Buddhist monks (if it happened in 1400 AD) centuries ago and planted in the lake. Shen-Miller's article cited the work of Japanese botanist Ichiro Ohga in the 1920s. Ohga was the first person to report the presence of old viable fruits in the lake bed. He also realised how old the fruits were and postulated that the lake was drained during the 1484 earthquake. Ohga was the Government Botanist of South Manchuria during the Japanese Occupation of northeastern Manchuria in the 1920s. He was helped in his field work by a local farmer, Liu Guay San. Farmer Liu collected most of the lotus fruits specimens Ohga used in his studies from the soil of his ancestral village. Unfortunately, farmer Liu was executed after the war for being a Japanese collaborator. Perhaps this goes to show that no good deed goes unpunished - however, I find the story fascinating. Who would have thought that one would find the plot for a novel in the American Journal of Botany? 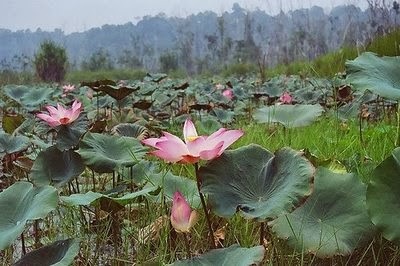 According to Shen-Miller et al, the sacred lotus has been cultivated in China for 5,000 years. All parts of the plant - seeds, rhizome (roots), leaf, stalk, flowers and fruit receptacle can be used as food. 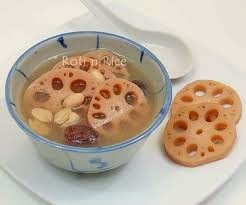 And not just any food - one of my favourite dessert is the lotus seed mooncake. 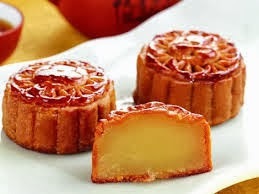 during the Mid-Autumn Festival also known as the Mooncake Festival. To return to Lake Chini - the other clue is the fact that the indigenous people living in the lake area, the Jakun and the Semelai, use languages which contain Khmer words. So what has this to do with the dragon? There is a huge amount of dragon lore or naga lore in Cambodia. Not surprising, as the Khmer Empire was based on the mastery of water. Water is all around and Tonle Sap and the Mekong River dominate the landscape. 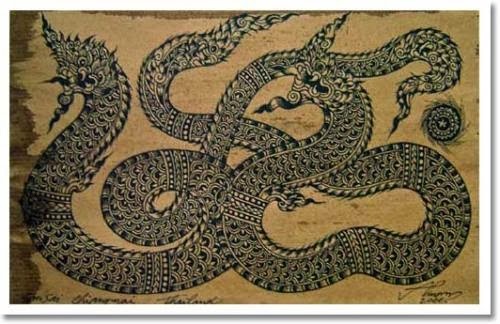 Although all the blogs about Naga Sri Gumum state that the Chini dragon legend has no connection with the Khmer lost city, I think there is a connection. I also feel that the legend of the dragon of Lake Chini is connected with the Lake Bera dragon. In fact, I connected the two in my retelling of the legend. There is in fact a Khmer legend about a naga prince who is captured and sacrificed. Apparently, his body was also eaten by the people of that city. This of course unleashed a terrible curse - a deluge drowned the entire valley and killed all the people. This legend is however set in Cambodia, probably around the great lake of Tonle Sap, the largest and most extraordinary lake in Southeast Asia. A fascinating read Tutu. Totally absorbing! Thank you Julia Dutta, I appreciate the comment! zuljb - The Dragon of Tasik Chini is one of eight stories from Eight Treasures of the Dragon. Available at MPH bookstores or you can order online from mphonline.com In fact, click on the link 'Buy' below the picture of the book.